Yeah. Astonishing and it’s absolutely true. I found her in me of all places. Once you spot her she shows up everywhere, hidden in plain sight. She says that she was never gone, never, never, not for one nano-second. I look at her with my eyebrows raised and a little hurt because she was certainly no where in sight when I was growing up. I didn’t even know she existed. I didn’t know even one of her names, let alone her thousands. In fact, I didn’t even know to look for her. And here is the real kicker. Because of that, I could not comprehend just how much I was missing her or how to recognize my own female reflection in divinity. Essentially I was Divine Mother blind. Seeing my old abandonment stories cropping up, she gives me that mischievous wild glint in her eyes and refutes the idea that she was MIA in one word – “Impossible.” We both laugh. Great Mother loves to laugh. It helps her balance out her terrible awful grief. And I mean terrible, but I won’t get into that too much. She exists in everything, not just that old Earth Mother title alone. I’m talking the big, the small, the whole enchilada. Every electron, every mountain, every star, every river, every piece of anything and even what we deem as nothing, too. Scientists cannot find the beginning nor the end of her great mysteries. But more than that, she is intricately woven in every story of our lives and of our deaths, in the heartbeat of our love and aliveness and each and every heartbreaking loss, every devastation in war, every famine and every time our tears run hot with hate or of pure grace when forgiveness comes like dawn after a night you never thought would end. Take Siri, the iphone operator, for instance, because Siri gets to be a “computer she,” with no rebuttal that she’s nonexistent. But she as in She, God? Come on now. Some people believe that alone is blasphemy, heresy, and well, her thinking a little too much of herself. Their one word response? Same word actually: “Impossible.” But they don’t have that same playful glint. More defensiveness and a wall up around that idea that is longer than the Great Wall of China. It’s okay. Really. Beliefs are sacred. People get to keep beliefs, especially those handed down for a long time in one’s family traditions, as an anchor to one’s personal reality and value systems. It is our spiritual artistry – being able to bring to the canvas of our lives what we discover in our hearts as true. Spiritual beliefs are deeply rooted and often engrained. If we were talking about politics, you might agree with me that there are differences among us in how we position ourselves that don’t always make us wrong in the absolute sense. But Divine Feminine? “She” might literally be too hard to conceive of for some, though quite honestly she is more ancient than anything we can reference, and in and out of every living matter recognizable. Conceiving, conception, creation are some of her many miracles proving her existence in what births, blooms, and dies and is reborn over and over again. In one of the many versions of the Holy Bible, God is also referenced as El Shaddai, the Many Breasted One. El Shaddai is translated most often as God Almighty. Shaddai interestingly enough also means Destroyer, Fertility, Sustainer. Destroyer is some of where her fierce nature lives because, as I eluded, she is complicated and multi-faceted. In early Hebrew writings God had a wife too, Asherah (one of her annunciations), meaning “One of the Womb” or Queen of Heaven. But this Ugartic fertility goddess after thousands of years of being worshipped was taken out of the story. A huge retelling occurred in the progression of many of our world’s major religions, leaving the Goddess as an aspect of God Himself MIA. To be clear, people in many other faiths, traditions, and cultures know her intimately, and her presence is even worshipped. But for others she was erased, first in holy texts, next in our minds, but I believe never in our hearts. How I eventually became fully conscious of her presence personally is unforgettable to me. Shame, grief, and betrayal were powerfully moving me off an emotional cliff of depression at the age of 23, in what we often describe as a dark night of the soul. Though my artistic abilities are far from decipherable, in a moment of quiet desperation I gathered a black and red felt tip pen and a yellow highlighter and began to scribble on a blank page images that would unlock the Great Mother from the prisons of my psyche. I needed her. I needed to remember that I was good, whole, worthy, and most of all loved. Yet as I was drawing I did not know that I was looking for her. Instead I drew a woman on her knees with her arms stretched above imploringly, prayerfully, beseeching grace. Above her in the upper left corner was a Magnificent Radiant Sun. The sun had a masculine stern face, and each line that I drew for him accentuated his gaze of anger, displeasure, and judgment at this pitiful woman before him. What took place next was the interesting part. Behind the woman on her knees, so clearly symbolizing me, a figure of night grew in black lines all around my lost soul. As I drew each black line I wept louder with wails too long withheld. The strands became the long black hair of darkness, became a hundred hands holding me at ground level up and a feeling welled up that I was neither alone nor lost in the dark. In the far upper right corner with my red pen engaged, a woman’s face began to emerge, and in contrast to the stern Father Sun God, her face was Loving Compassion, revealing my sorrow was also her sorrow, my loss her loss. She kept reaching out all around me, under me, above me and everywhere she could caress her daughter. My outer skin was sketched yellow like my Sky Father God, but incessantly I drew on the inside of me in this caricature, the black lines of Mother Night outlining my entire body from within. Sometimes you live your whole life out seeing only what is on the outside and never discover who you really are on the inside. 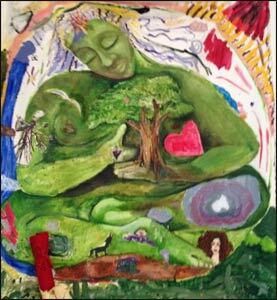 We hear talk of embodying the sacred feminine and what this means. In that moment I witnessed her at my back and literally woke up to the obvious. She was in me all along. This sweet recognition is better than the movie scenes when someone you thought was dead is actually alive or when the little orphan discovers after years of turmoil a loving family, or even the wild kiss of two lovers who will never be parted again. We live for these moments of reconciliation. The power is in the lifting of the veil when something that has hurt us deeply is finally understood and our hearts heal in the holy, in the beauty, in the love within our Mother’s arms no longer out of reach. With her, we come home ourselves and realize that one tiny pronoun can radically alter whether we see Her or whether we don’t. In investigating this, we risk changing ourselves in how weview our own divinity, not only as women but as all the sons and daughters who emerge from the womb of life.